Tonight, Ohio State placed six wrestlers into the B1G Finals. In the process, the Buckeyes jumped out to a 117-98 lead over prohibitive favorite Penn State. When 141 pound Micah Jordan pulled off a signature win against Iowa’s Brandon Sorenson, thoughts turned to bigger things. A half hour later the big night was stamped in near complete in scarlet text when Myles Martin did it again. As Martin did in the NCAA finals last year, he put Penn State’s Bo Nickal on his back after a dramatic takedown at the edge of the mat. And like last year, the upset, this time at 184 pounds, was dramatic and sweet. 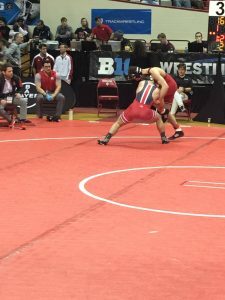 Martin was not awarded back points despite the vociferous challenge of Buckeye coach Tom Ryan, but the lead was taken and it would not be relinquished. 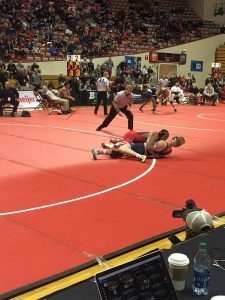 Later, wrestling side by side, Kollin Moore and Kyle Snyder conducted takedown-a-thons to put Buckeyes in the finals at 197 and 285. Kollin made his a little “moore” dramatic, scoring two seemingly effortless and early takedowns, only to fall behind and then get two late takedowns that required even less effort. On one, Moore’s Nebraska opponent shot in too far to Moore’s side. All Kollin had to do was turn and wrap arms around the failed aggressor. While Bo Jordan had a seemingly close bout in the afternoon, he fairly easily handled Myles Amine of Michigan to claim a 165 pound final berth. That happened just as his cousin Isaac (Wisconsin’s 165 pounder) was denied a chance at overtime by a very, very dubious failure to advance from the top penalty point. At 133, Nathan Tomasello was pushed to the max by Michigan’s Stevan Micic, but in the end had enough to advance. Jose Rodriguez and Cody Burcher will each wrestle for seventh after going one for two in their consolation bouts. 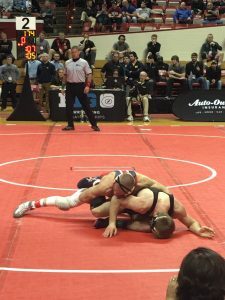 Each needs to win–seven is the number of automatic NCAA bids for the B1G in their respective weight classes (125 and 165). Jake Ryan lost his consolation bout in overtime, but came back to win the first bout in a little mini-tournament to determine ninth place. This bonus wrestling is necessary because of the nine automatic NCAA bids the B1G receives at 157. So, the plan to simply get the injured Ryan to qualify remains in place–win tomorrow and wrestle in the NCAA tournament in St. Louis in two weeks. We will be back with more tomorrow, including photos. You can find some photos on twitter @motsag and @twuckeye. Go Bucks!